A brand new 501(c)4 "non-profit" calling itself The Foundation for North Carolina is throwing Gov.-Elect Pat McCrory's inauguration party at the Raleigh Convention Center and intends to help him guide the state toward "market-oriented solutions." "The foundation filed its incorporation papers on Nov. 20, the same date that McCrory announced he would attend the group's event at Raleigh's downtown convention center." Secret donors with a philosophy straight out of the Art Pope bible. 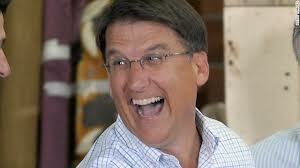 McCrory took the bait on pay-to-play politics faster'n a goose goes after a Junebug.